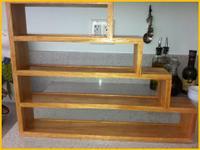 You may have the kind of kitchen space that would accommodate a large spice rack or even several smaller ones. And, if that is the case, spend time really looking for just the right one to suit your style, considering: ease of use (can you get to them easily), if the rack holds several different size jars, clean-ability (how difficult will it be to keep it clean) and aesthetics. Please remember that exposed racks get dusty (like everything else in the house) and the steam that emanates from cooking creates a sticky surface for the dust to stick to. My lovely little glass vials require regular washing with soap and water to keep them clean. I still like the way it looks while holding 16 vials in a 6-1/2 x 3.5 inch space. However, I keep a lot on hand and would have to spend hours keeping several racks of this kind clean. I'd rather be cooking! So, for my style, my 20 x 24 x 4 drawer works perfectly. 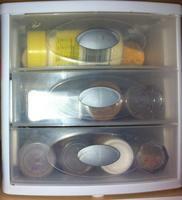 The drawer keeps it free of dust and I like the jars to lay flat so that I can find things easily. I found a wooden rack (pictured above )and placed it in the drawer to begin space definition. Then placing a couple of jars in the empty space, figure out where wood slats would make sense to hold the line in straight a row. A good hardware store, like Lowes, sells lengths of wood (approximately 2 x 1/2") and will cut them for you into the lengths required. This is not at all difficult, but does require a bit of thought and planning. The end results are so very worth it! 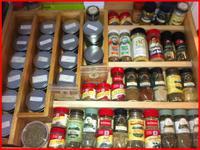 If you do not have a nice sized drawer to store your spices dust free, there are other, very simple, methods. Plastic drawer sets (as pictured) are a good alternative. 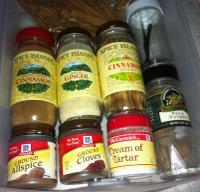 In fact, that is how I store my baking spices. They are light weight and can easily be moved to where you are working in the kitchen and when done, slide back into its slot. And, the drawer sets can be found in a large variety of sizes and are quite inexpensive! The drawers shown are on the small side measuring 9 x 9 x 9, containing three drawers. We use two sets: one set for baking, as shown, and another for birthday candles, special sprinkles, short dowels and other little decorating items. 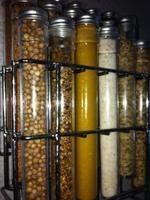 You may find one of these Spice Spaces suitable for your cooking needs, or use all of them as we do here! This organization will launch you on your way to The Everyday Gourmet that you are!